US Army Pershing II battlefield support missile, 1982. Although the treaty itself didn’t ban actual nuclear weapons, it removed key nuclear delivery systems from the inventories of both the U.S. and U.S.S.R., dramatically lowering the number of nuclear weapons deployed in Europe. Russian 9M729 cruise missiles in their launch canisters. Russia insists the missile’s range does not violate the INF Treaty. The treaty sailed on well into the 21st century without a hitch, until 2014. That year the U.S. warned that it had detected signs Russia was cheating on the treaty, and in early 2019 Washington announced its intention to leave the INF treaty altogether. Now, as Military Times reports, Washington will test two new missiles within days of the official ending of the treaty. The first missile is a ground launched cruise missile “with a potential range of about 1,000 kilometers”—AKA 621 miles to Americans. This mirrors the Gryphon cruise missile, or GLCM, (pronounced “Glick-em”.) The Gryphon was actually a ground launched version of the Tomahawk cruise missile. A cruise missile, Gryphon was launched from a missile trailer via a booster rocket that propelled it high and fast enough for the onboard turbine engine to kick in. Once in the air Gryphon cruised along at subsonic speeds, flying a low, radar-evading route before delivering a 10-50 kiloton variable yield thermonuclear warhead. The U.S. Air Force deployed 322 Gryphons divided among 95 launch vehicles before they were destroyed under the terms of the INF Treaty. A JASSM missile undergoing launch tests from a F-16 fighter over the Gulf of Mexico, 2018. Not much is known about the new ground-launched cruise missile. It could be yet another iteration of the Tomahawk land attack cruise missile, still in service with the U.S. Navy as Tactical Tomahawk, or Tomahawk TLAM-E. It could also be a land-based version of the Joint Air Surface Standoff Missile, or JASSM, an air-launched cruise missile first used in the 2018 air strike against Syrian chemical weapons facilities, A longer range version, JASSM-ER (Extended Range) has a range of 621 miles—exactly the range of the new ground-launched missile. The new cruise missile is set to begin testing in August. The second missile is a ballistic missile with a maximum range of “3,000 to 4,000 kilometers”, or 1,864 to 2,485 miles. Unlike cruise missiles, ballistic missiles are launched straight up into space. The missile releases its warhead into low earth orbit, and the warhead then de-orbits above the target, bearing down at hypersonic speeds onto its target. This mirrors the American Pershing II missile, which was controlled by the U.S. Army. The Pershing II had a 5-80 kiloton warhead and a range of 1,056 miles. Two hundred and thirty four Pershing IIs were destroyed to comply with the INF Treaty. The new ballistic missile is even more mysterious as there is no missile, like JASSM-ER, that can be ported over from another launch platform. Unlike cruise missiles, which can fit on aircraft, ballistic missiles are so large they are typically only launched from submarines or land. One possibility is that the U.S. uses a booster derived from missiles used to test missile defenses, while another is that Washington develops a completely new booster. Whatever it is, the new missile is expected to be tested in November. Neither of the new missiles will have nuclear warheads—they will instead use conventional high explosive warheads. This suggests that the U.S. doesn’t think Russia’s new treaty-busting cruise missile, 9M729, is currently equipped with a nuclear warhead. The U.S. might eventually field such a warhead but the cost associated with developing new nuclear weapons means the U.S. will probably not develop one first if it can help it. The U.S. will also almost certainly try to get its allies in Europe and Asia to host these missiles, and conventional missiles will have an easier time winning approval from local governments than nuclear ones. Range fans for a 4,000 kilometer ballistic missile launched from Guam and the Aleutian Islands. The United States will likely send these missiles not just to Europe but also Asia. 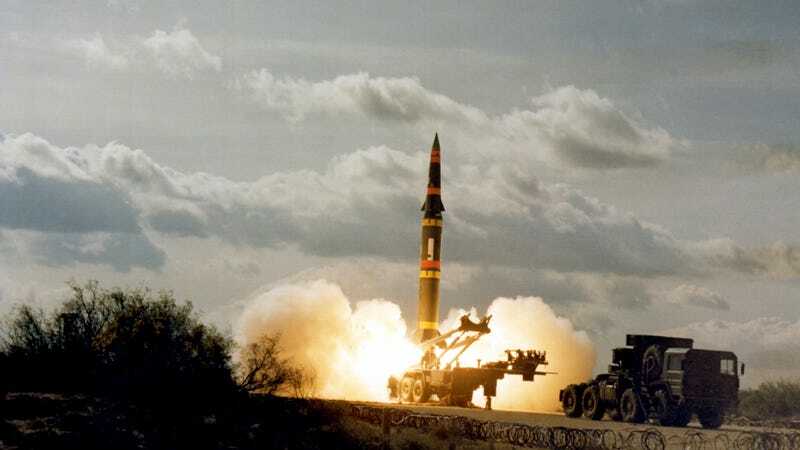 China, not a signatory to the INF Treaty, has large numbers of medium and intermediate-range missiles which it could use to bombard U.S. bases across the Asia-Pacific in wartime. The ending of the INF Treaty will allow the U.S. to match these deployments with missiles of its own. From the U.S. territory of Guam a 4,000 kilometer ballistic missile could target most of eastern China—including Shanghai and (just barely) Beijing. Similarly, a 4,000 kilometer missile based in the Aleutian islands chain could target northern China. Missiles based at locations such as South Korea and Japan could reach deeper into the Chinese interior. The end of the INF Treaty has so far not triggered the worst-case scenario: deployment of new nuclear-tipped missiles by both sides. This could still happen, but in the meantime the lack of new nukes is a huge relief. The U.S. appears interested in quickly punishing Russia for cheating and to take advantage of the treaty’s end to boost its conventional firepower against China. Nobody appears interested in introducing new nuclear weapons—for now anyway.